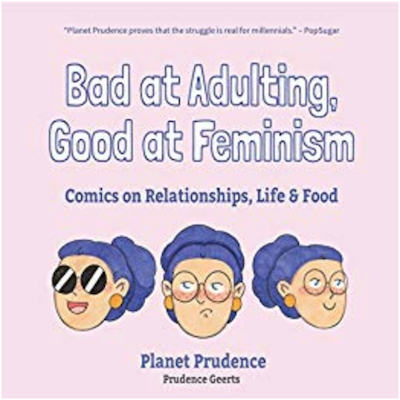 It would be easy to cast aside Prudence Geerts' charming book Bad at Adulting, Good at Feminism: Comics on Relationships, Life, and Food as a quick-read novelty. That would be a mistake. People often confuse pleasant, fun things as being shallow and not worth serious thought. This little gem happens to be both pleasantly fun and engaging on a deeper level. This book, arranged in topic-based chapters such as "Inside and Out," "Finding the Strength," and "Om Nom Nom," runs 200 pages. Each chapter is a series of lively, witty, and often deceptively simple comics, featuring a plucky blue-haired protagonist as Prudence's chosen avatar. Whether she goes on adventures out into the confusing and complicated adult-world, stays in to cuddle with her cat, or can't stop thinking about pizza, Prudence takes us along for the ride. At first shake, I pegged Prudence for a classic self-deprecating comedienne, poking fun at her life (especially body frustrations) to get a good chuckle. Multiple illustrations are dedicated to the hilariously disappointing world of fashion on non-model's bodies to great comedic effect. After a time, I realized her intent was more nuanced than that. Self-deprecation by nature is taking value away from something. Prudence was not devaluing herself and her frustrating, uncooperative body for a laugh (even on her hairy leg days)—she was engaging in a form of everyday, self-empowering body acceptance. Considering how many women struggle with these same insecurities, her work takes on a different layer of meaning, one that implies, "I can totally relate." That relatability is my favorite part of Prudence's work and the reason for its hidden depth. It is easy to see how most women could connect to a few of her struggles at some point in their lives. For me, it was her illustrations on life with chronic illness. This set of comics is not necessarily meant to be funny. They are meant to show a specific truth in her everyday life, a bigger struggle that lurks beneath all the others. This is more relatable to women than you might think. Recent studies have shown that chronic illness (particularly autoimmune disease) is weighted more toward women than men. In fact, 75% percent of autoimmune illness belongs to women. In America alone, that adds up to 30 million women, and that is just chronic illness as a result of autoimmunity. Prudence, who suffers from debilitating chronic fatigue syndrome (also known as myalgic encephalomyelitis), understands what it is like to have an incurable, lifelong condition. The truths she brings to the artist's table on this subject are undeniable—it is isolating, limiting, and difficult to explain to others. For those with chronic illness, feeling seen and understood in this way is priceless. Prudence is able to see her struggles as a shared burden with her fellow sisters and is hoping to lighten the load for all of us, even if just a little. We are encouraged to own and make peace with our "flaws." Our everyday bravery for just getting through a tough day is rewarded with love and color. That is truly the message of this book—"You are seen."